A few months ago, I challenged myself to do something deliberately active once every day. 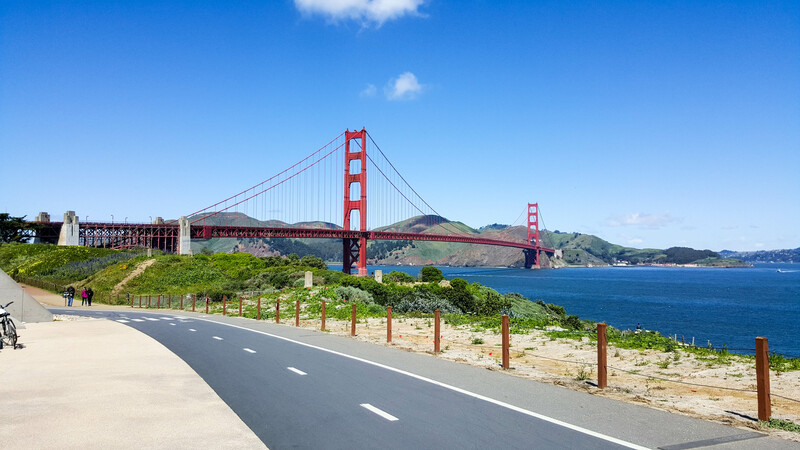 Recently, my husband and I visited San Francisco, and while I’ve been there several times, I’ve never biked across the Golden Gate Bridge. My husband had, and he thought I would really enjoy it. So in the spirit of staying active, we grabbed rental bikes and off we went (our selfie game needs serious work). Golden Gate Bridge from near the Presidio. We enjoyed the ride, stopping A LOT along the way (don’t miss the in between when you’re getting from point A to point B! ), and the fantastic view from the bridge on a great clear day (hooray, no fog!). Instead of hopping a ferry back to the city once we made it to Sausalito we decided to park the bikes for a bit, do some exploring in Sausalito, then continue on to Tiburon and do some exploring there. We had taken several meals with us as well as plenty of water and lots of layers, so we were prepared for a long day out. Sausalito homes on a hill. 20+ miles later we returned the bikes and headed for dinner. We were a little tired and sore, but had a great day of adventure seeing some new parts of the Bay Area in a fun and active way. I’ll definitely keep bike rental in mind for future tourist outings – it was a fun, cheap, healthy way to cover a ton of ground in just one day. Would love to hear what other suggestions you have for interesting, outdoorsy ways of exploring new places.